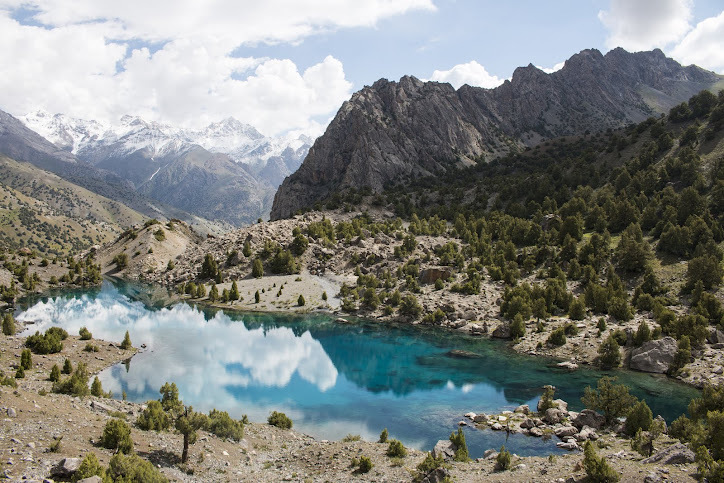 Finally I have found time and a decent internet connection to do a little update of my Pamir adventures. Well, actually I'm in a different mountain range, although you could consider it a sub-range: the Fann Mountains. Less than a 100 km north of Dushanbe as the crow flies, this small mountain range has massive peaks well over 5000m. I started out in Hakimi, near Dushanbe and walked in three days over the Mura Pass (3760m) to the famed Iskander Kul. The past three days I did a three day trek along deep blue lakes guarded by jagged snow capped mountains. Tonight I'm in Penjikent to watch my fellow countrymen win the World Cup football, tomorrow (12th of July) of to the Fann again! Here's some photographs, enjoy!